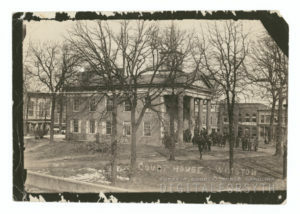 Salem became the central and largest town and by the middle of the nineteenth century the population of the area had grown to the extent that the North Carolina General Assembly voted in 1849 to form a new county, Forsyth, out of part of Stokes County. With the new county came the need for a new county seat, and in 1851 the Moravians sold 51 acres approximately 500 yards north of Salem on which to build the town of Winston. The town of Winston was established with a Courthouse square and a grid pattern of streets surrounding it. The town of Salem and the Forsyth County Commissioners had agreed that the streets of the new town should be continuations of the Salem streets and that the Courthouse should be erected at the highest point on the main street. Seventy-two lots were drawn off, and with the exception of the Courthouse lot, they were sold at public auction in May and June, 1849. 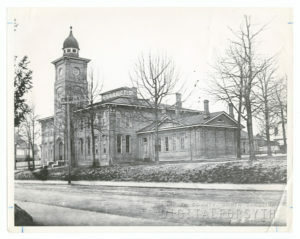 The new courthouse was completed in 1850, and several commercial buildings and residences were built in Winston by 1851. After the Civil War, in the last third of the nineteenth century, both Winston and Salem expanded their industrial pursuits and Winston experienced phenomenal growth. Between 1870 and 1880 Winston’s population increased from 443 to 4,194. After the Northwest North Carolina Railroad connection was completed from Greensboro to Winston in 1873, Winston really thrived. Richard Joshua Reynolds came to Winston and opened his first tobacco factory in 1875, and in 1879 the First National Bank of Salem was re-chartered as Wachovia National Bank and moved its offices to Winston. In 1885 the first Board of Trade (later the Chamber of Commerce) was organized and in 1889 another important rail connection, the Roanoke and Southern, was realized. In 1885 the Union Republican newspaper reported that the building boom that year had equaled any past year in Winston s history that the total value of the new buildings that year was at least $200,000. In the 1880s many prominent businessmen and industrialists, including James A. Gray of Wachovia Bank, tobacco manufacturers J.A. Whitaker and R.J. Reynolds, Robert Glenn (NC governor, 1905-1909), attorney Eugene Gray, and others built houses along Cherry Street, Fourth Street and Fifth Street. The West End Graded School opened its doors in September 1884 at the corner of Fourth and Broad Streets. Winston was expanding to the west and northwest. The 1890s were years of even further growth and development in Winston. The population reached 14,000 in 1890–an over 100% increase in ten years. Winston’s grid of streets now extended from First Street north to Seventh and from Hickory Street west to Summit. Most of the tobacco and textile factories were located east of Elm Street (now Marshall) and south of Fifth Street, Winston’s finest residential section continued to move west along Fourth, Fifth, Broad and Summit Streets. The Winston-Salem City Directory for 1891/1892 described the city as having “taxable property of about $5,000,000, electric lights, an electric street railway, water works, two fire companies, and factories, stores and residences being completed at the rate of three per week, and this is far short of the demand.” It also described a $100,000 hotel “under contract.” In the 1890s at least seven development companies were formed to capitalize on the great building boom. One of these was the “West End Hotel and Land Company” – mentioned in the City Directory as developing a $100,000 resort hotel and the residential area surrounding it.